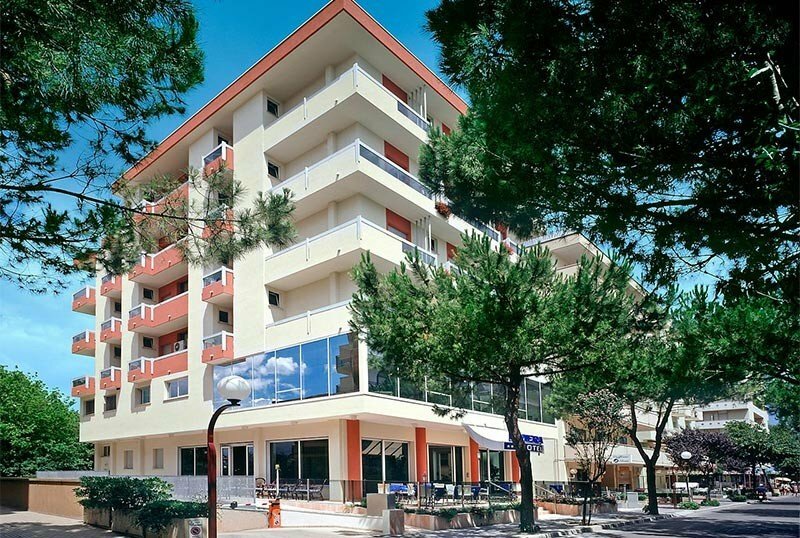 The 3-star Hotel Riviera in Misano Adriatico is family-run and is ideal for holidays for the whole family. It is located near the sea and in a convenient position to reach the Misano racetrack. The hotel has free parking, bicycles, WI-FI and local cuisine with bespoke proposals for coeliacs and vegans. Accepts small pets. The hotel is located in Misano Adriatico, near the center and a couple of minutes walk from the beach. The location is convenient for those who want to reach the Misano World Circuit Marco Simoncelli, less than 10 minutes drive away. All rooms are soundproofed, equipped with electronic access and balcony, as well as free WI-FI, air conditioning, satellite and digital TV, telephone, safe, mini fridge, bathroom with shower and hairdryer. COMFORT : single, double / twin, triple or quadruple rooms without sea view. Large outdoor area, hall with bar and reading area, terrace with solarium, lift, bikes available for free even with child seat. Laundry service on request. CONVENTIONS : beach, shuttle to and from airport. BREAKFAST : buffet with sweet and savory dishes including pies, croissants, ring-shaped cake, cold cuts, cheeses, yogurt, fruit juices and, on request, eggs and bacon. LUNCH AND DINNER : you can choose between 3 menus based on meat and fish, prepared according to the local tradition. Pasta and desserts are homemade. VARIATIONS : vegetarian cuisine, vegan and celiac dishes (both on request), variations for those with particular food intolerances. OTHER: every week a great buffet dinner is offered with Romagna specialties of land and sea, every Sunday an aperitif is offered. In hotel : indoor and outdoor playground area and strollers. On request: baby sitter and pediatrician. In the room : cots and cribs with shores. At meals : baby food , baby menu, high chairs at the table. The hotel has an agreement with a number of establishments covering a large stretch of beach: from 27 to 38. Many services are dedicated to both adults and children. Prices are per day, per person, for a minimum of 3 days in full board.